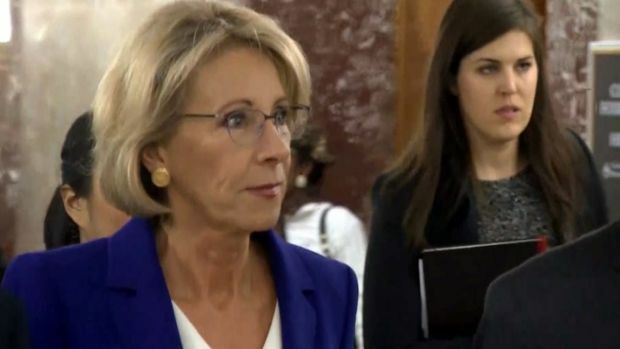 Angry activists in D.C. shouted ``stand up, fight back'' and one protester was arrested, as Betsy Devos made her first visit to a public school Friday as education secretary. News 4's Mark Segraves reports. Newly confirmed Secretary of Education Betsy DeVos had to enter a middle school in Southwest Washington through the back door after protesters blocked the front entrance. The crowd, which included parents, union officials and teachers from other schools, stood outside Jefferson Middle School Academy Friday morning with signs that read, "Welcome to our public school. It's open to everyone!" and "Ms Devos: Our children are not props." One protester was arrested for blocking a driveway and refusing to move, police said. It was DeVos' first visit to a public secondary school since she was confirmed by the Senate Tuesday by a historic 50-50 tie vote broken by Vice President Mike Pence. DeVos met with D.C. Public Schools Chancellor Antwan Wilson, Jefferson Academy Principal Greg Dohmann and other school leaders once she got inside the school. In a statement released after her visit, DeVos said she respected the protest, but "no school door in America will be blocked from those seeking to help our nation’s school children." "I respect peaceful protest, and I will not be deterred in executing the vital mission of the Department of Education," the statement read. A D.C. Public Schools spokesperson called the meeting with DeVos "productive." D.C. Mayor Muriel Bowser also defended the group's right to protest peacefully, but spoke against violence toward anyone. "DC has the fastest growing urban school district in America. We welcome @BetsyDeVos & anyone who wants to learn more about our schools," she wrote on Twitter. White House senior adviser Kellyanne Conway also weighed in on the protest on Twitter, writing, "Don't we want the Sec of Education to visit schools?" DeVos has been a strong advocate of charter schools. She faced criticism and ridicule for a perceived lack of experience and confusion during her confirmation hearing. At one point, she said schools should be allowed to have guns if their districts wanted, citing the threat of grizzly bears in Wyoming. Mike Pence became the first vice president to break a tie for a cabinet hearing, confirming Betsy DeVos for education secretary despite objections from Democrat and some Republican senators. 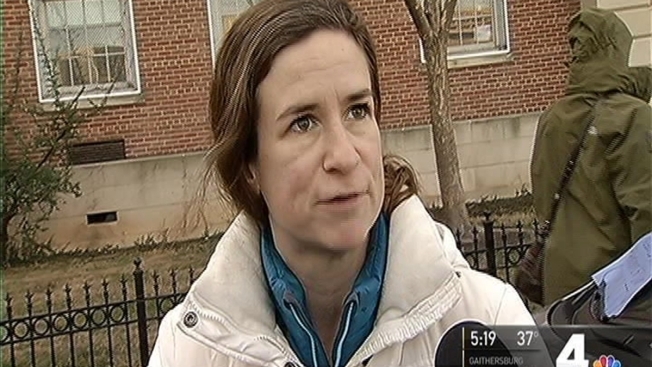 Jefferson Academy teachers were to stay in their classrooms during the protests. Washington Teachers' Union President Elizabeth Davis said the protesters "love our public school system."